It’s been thirty plus years since I was in St. Louis, and that was for an unmemorable business trip. 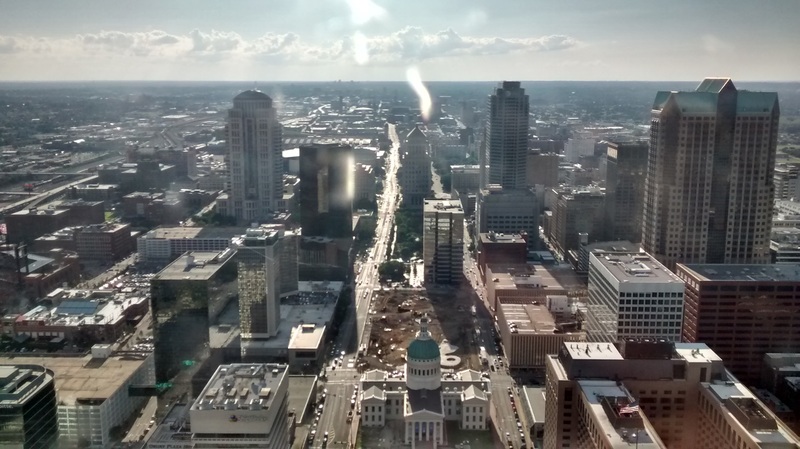 If you are to visit though, it’s hard to pick a better location than the downtown Hyatt, as it is virtually in spitting distance of the Gateway Arch. I am here because NetRoots Nation 16 is being held here in one of America’s most chocolate cities. Their choice of St. Louis is perhaps in response to last year’s conference in Phoenix. There then new Democratic presidential candidate Bernie Sanders encountered some virulent Black Lives Matters protesters, and epically failed to respond appropriately, as did its mostly white attendees. There might be more people of color here if this convention were more affordable. The official convention hotel rooms are $200/night and a discounted registration runs more than $300. The non-subsidized rate is $800. So with airfare it’s easy to spend $1500 or so for the privilege of communing with fellow progressives for three days and perhaps seeing an important politician or two. The cost is apparently not an obstacle for the 3000 or so attendees, and wasn’t for me although I chose the Hyatt because it is considerably less expensive with my AAA discount. 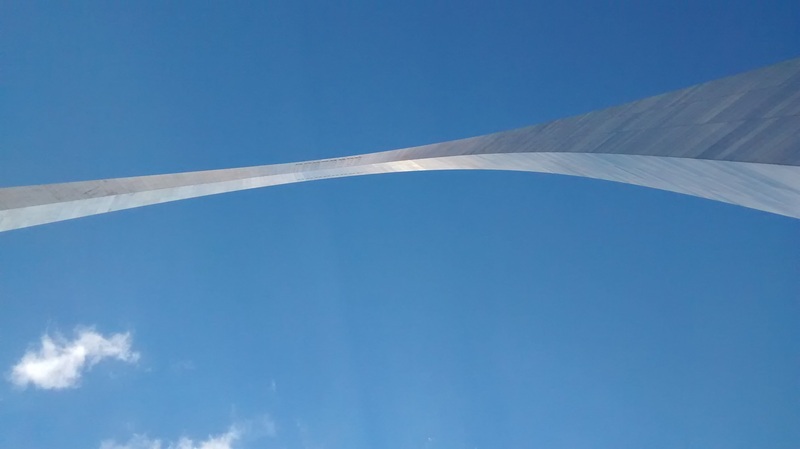 A driving tour of St. Louis last night facilitated by my longtime friend Tim left me impressed. The St. Louis area reminds me a lot of Baltimore with many traditionally ethnic neighborhoods. 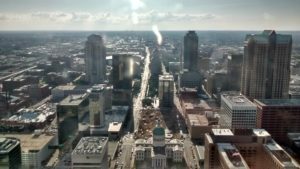 St. Louis is a bright blue dot and the economic engine of the state, but it is still in a red state. Unsurprisingly there are quite a few issues of local concern being discussed, including a so far failed attempt to make Missouri a “Right to Work” state. But it is a surprisingly pretty place and cooler than I expected in mid July, although this may be an aberration. While known for its beer, now owned by European masters, there are lesser known foods of interest. I tried one at dinner last night with Tim: toasted ravioli. Two thumbs up. If the rest of America knew how good it was, its popularity would quickly spread. St. Louis has a metro, an apparently relatively recent creation undergoing a slow expansion. The trolley lines of a hundred years ago are being put back in in places. Their metro doesn’t go that far, at least north and south, but it does go to Lambert, i.e. St Louis International Airport. I took it into the city on Wednesday and found it both convenient and affordable. You pass stadiums, hospitals and eventually are deposited downtown where walking the mostly empty streets near twilight felt a bit scary. Along Big Muddy (the Mississippi) it is appropriately touristy with amenities like a steamboat cruise and carriage rides. It is often humid at this city at the confluence of the Mississippi and Missouri rivers. As for NetRoots Nation 16, it seems lower key than in past years based on anecdotes I hear. As I noted last year Bernie Sanders attended. I don’t expect to see him this year, not surprisingly as his campaign is over. So far the only politician of note spotted was Rep. Alan Grayson, annoying for a liberal, who is running for Marco Rubio’s Florida senate seat. Perhaps more notable politicians will show up in time. Speaking of confluences, NetRoots Nation is a confluence of passionate people embracing so many causes it’s hard for them to concentrate on any of them. There are plenty of well attended seminars where issues and strategies are hashed out. (For two seminars, I volunteered to monitor the stream in case there were video or audio issues.) There are training sessions in how to do non-violent protests or wage a campaign for political office. So stuff does happen here, it’s just seems amorphous at times. I am pondering what to make of this first attempt to attend a political convention. It turns out that making change is really hard. I’ve attended a number of seminars on the Black Lives Matters movement. It’s hard for a white guy like me to feel up to speed on all their issues. As speakers detailed the staggering challenges they face, it’s hard not to feel how Herculean an endeavor this is or how I can contribute in a meaningful way. Yesterday a speaker pointed out that sixty years ago the Rev. Dr. Martin Luther King had approval rates of just 10%. A majority of Americans polled thought that blacks were being too aggressive in their push for civil rights and needed to be nicer and stop trying so hard. Sixty years later while there has been progress there are still staggering amounts of institutional roadblocks that contribute toward the oppression of black people. These include gentrification, those “right to work” laws Missouri is trying to enact, crime, continuous harassment by police (the riots in Ferguson occurred here), under-funded schools, poor air and water quality in their neighborhoods and general poverty. It’s a game of multi-dimensional chess that has to be played simultaneously on many levels. It’s a hard game for blacks to play because they are bearing the weight of oppression so it needs white people like me to fight with them. That is hard to do too when you have not spent your lives unfairly defined by the hue of your skin. And this is just one of the issues that are of great concern to progressives. It’s hard not to feel despair. Unsurprisingly a lot of the attention here is on the November election and here at least there is a lot of hope. With political power comes the chance to wield it, although there are so many obstacles in trying to wield power (as President Obama can attest) that it’s not hard to feel maudlin even if Democrats win both the White House and Congress. The chances for meaningful change are chancy at best. Realistically, meaningful success is much like those of a tightrope walker without a pole, in the wind with the rope vibrating. It takes a brave progressive to take on these causes anyhow, and a lot of them are here. The hoopla largely dies down tomorrow night. I fly home on Sunday.